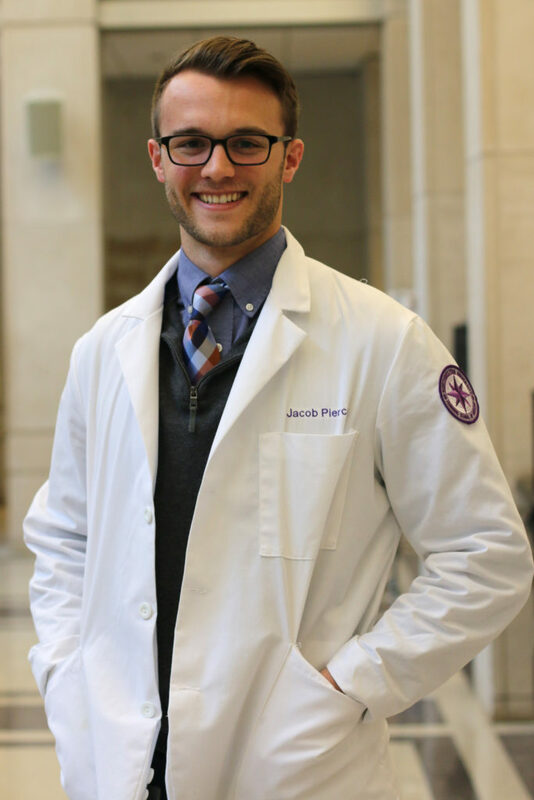 Jacob Pierce, a third-year medical student who is also pursuing a master’s in public health, studies the connection between adverse childhood experiences and cardiovascular disease. Traumatic experiences during childhood — such as violence at home, abuse or bullying — are known to be associated with cardiovascular disease risk factors later in adulthood. However, it had remained unclear whether exposure to what are collectively called Adverse Childhood Experiences (ACEs) actually contribute to heart attack or stroke. Jacob Pierce, a third-year student in Northwestern’s MD/MPH Combined Degree Program, is the first author of a recent study that helps to provide new insights into the connection between ACEs and cardiovascular disease. Using a prospective cohort of more than 3,000 participants, Pierce found that people exposed to the highest levels of childhood family environment adversity were more than 50 percent more likely to have a cardiovascular disease event over 30-year follow-up, even after controlling for other risk factors. 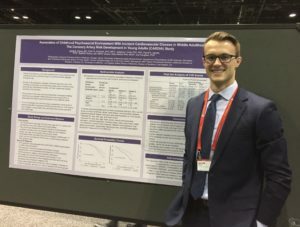 Pierce, who conducted the research under mentor Joseph Feinglass, PhD, research professor of Medicine in the Division of General Internal Medicine and Geriatrics and of Preventive Medicine, recently presented his findings at the annual American Heart Association Scientific Sessions in Chicago. When I was going through the application process, Feinberg stood out as having a combination of everything I wanted in a medical school. I was looking for a school where I could receive excellent clinical training, as well as an institution with abundant opportunities to do impactful research — and Feinberg does both of those things exceedingly well. Additionally, I was interested in pursuing a master’s in public health, and the opportunity to complete the MD and MPH dual degree program in four years was a unique aspect to Feinberg that really drew me here. Beyond the academic quality and opportunities at Feinberg, it was really my experience with my current classmates at Second Look that made Feinberg an easy choice. My classmates have become some of my best friends, and that’s been a huge part of my experience at Feinberg. Why did you decide to pursue a master’s in public health? Entering medical school, I was interested in investigating the intersection between social determinants of health and clinical medicine, and how I could impact both of those arenas as a physician. The public health program at Feinberg allowed me to take a deep dive into both public health and clinical medicine. The coursework has been really influential in my experience at Feinberg, particularly with participating in research. The biostatistics and epidemiology classes that we take through the MPH program provide us with a strong foundation of knowledge and practical skill set that easily translate into participating in and leading research projects. How did you become interested in studying ACEs? During my first year at Feinberg, I had a basic understanding of ACEs and some of the research that had been done on them. When choosing an organization with which I would do my internship for the public health program, I learned of the Health & Medicine Policy Research Group and their Adverse Childhood Experiences Collaborative with many of the health systems around Chicago. While presenting my poster on my findings at my internship, I was fortunate to meet Dr. Feinglass, who would later become my mentor. We discussed the possibility of investigating the relationship between ACEs and cardiovascular disease — which is one of my areas of interest in clinical medicine — and this project is really a product of that meeting. Our study extends our understanding of the effects of childhood psychosocial trauma on cardiovascular disease — primarily heart attack and stroke — over an individual’s life course. Many studies have retrospectively demonstrated an association between ACEs and cardiovascular disease outcomes, but our study is one of the first studies to demonstrate this association in a prospective cohort. Stated simply, our study shows that childhood psychosocial trauma is associated with an increased risk of cardiovascular disease into our fifties and sixties — even after controlling for many risk factors, such as blood pressure, diabetes and smoking in young adulthood. Pierce presented his findings at the annual American Heart Association Scientific Sessions in Chicago in November. We were fortunate to be able to present some of our findings at the American Heart Association Scientific Sessions in November, and the abstract was published in an online supplement to the journal Circulation. We’re currently finishing the manuscript and getting ready to submit it for publication, which is really exciting for me. One of the big questions that this research project has prompted is essentially, “Okay, so now what?” We know that childhood trauma is associated with increased risk for cardiovascular disease — so now what can we do to prevent heart attacks and strokes from occurring? Cardiovascular disease is still the number one cause of mortality in the United States, which is a pretty sobering fact. As a physician, I hope to work on both the clinical and research aspects of cardiovascular disease prevention to try to move the needle on that statistic.